Based in New York City, the Aizuri Quartet was the 2017-2018 MetLiveArts String Quartet-in-Residence at the Metropolitan Museum of Art, presenting five unique programs throughout the season, which the New York Times called “genuinely exciting” and “imaginative." Previously the Quartet was the 2015-2016 Ernst Stiefel String Quartet-in-Residence at the Caramoor Center for Music and the Arts, and from 2014-2016, the String Quartet-in-Residence at the Curtis Institute of Music in Philadelphia. Throughout its residency, the Quartet appeared internationally in Curtis on Tour performances in Bremen, Dresden, Paris and Salzburg, in Aspen, Logan, Napa, La Jolla and Davis with clarinetist Michael Rusinek, at Boston’s Isabella Stewart Gardner Museum and New York City’s Morgan Library and Museum with cellist Peter Wiley, and throughout Chile, Costa Rica and Mexico with violist Roberto Díaz. Additionally, the Quartet was the resident ensemble of the 2014 Ravinia Festival’s Steans Music Institute and was the recipient of the Salon de Virtuosi JCCI Career Grant. Highlights of the Quartet’s recent and upcoming seasons include a multi-city tour of Japan, debut recitals at the Kennedy Center’s Fortas Chamber Music Concerts, the Women’s Musical Club of Toronto, the Philadelphia Chamber Music Society, Wolf Trap’s Chamber Music at the Barns, Schneider Concerts in New York City, Princeton University’s Summer Chamber Music Concerts, the Chamber Music Society of Minnesota, Chamber Music Society of Bethlehem, the Artosphere Festival and the Honolulu Chamber Music Series, and residencies with Cornell University, Scrag Mountain Music, North Carolina State University, Chamber Music Abu Dhabi, and IRIS Orchestra. Finding great joy in working with contemporary composers and exploring unusual collaborations, the Aizuri Quartet is proud to have commissioned and premiered works by Pulitzer Prize-winner Caroline Shaw (Blueprint), Paul Wiancko (LIFT), Yevgeniy Sharlat (RIPEFG), Gabriella Smith (Carrot Revolution), Rene Orth (Stripped), and Alyssa Weinberg (Parallels). The Quartet’s many and varied collaborative partners include pianists Jonathan Biss and Ignat Solzhenitsyn, clarinetist Kinan Azmeh, shakuhachi player Kojiro Umezaki, eighth blackbird in specially-curated performances of Terry Riley’s “In C,” the Aeolus Quartet, poet Denice Frohman, and singer-songwriter Andrew Lipke. Most recently the Quartet premiered the 65-minute chamber opera Sophia’s Forest by Lembit Beecher, featuring the Aizuri Quartet, soprano Kiera Duffy, and expansive, custom-built sound sculptures in Philadelphia in September 2017. Its debut album, featuring new works written for the Aizuri Quartet, will be released by New Amsterdam Records in Fall 2018. 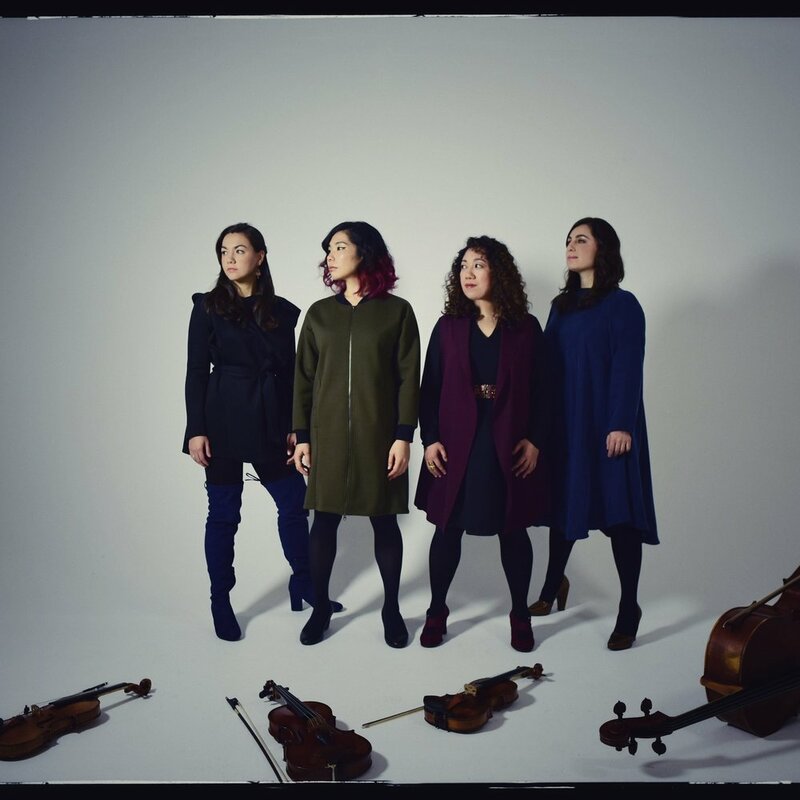 Combining their deep study of classical music with a naturally warm and exuberant approach to audiences and students, the Aizuri Quartet is passionate about creating diverse points of entry into the string quartet repertoire. As its 2015 resident ensemble, the Quartet worked closely with Philadelphia’s Barnes Foundation to develop programs and commission new works that forged meaningful connections between music and visual art. The Quartet was featured throughout the Curtis-Coursera online course “The World of the String Quartet,” which was hosted by Arnold Steinhardt and has reached thousands of students from over a hundred countries. Comprising four distinctive musical personalities, “each one a magnificent musician in her own right” (Washington Post), the Aizuri Quartet “is in full possession of that most elusive of string quartet qualities: the balance between charisma of the individual and cohesion of the collective” (Philadelphia Inquirer). Formed in 2012, the Aizuri Quartet draws its name from “aizuri-e,” a style of predominantly blue Japanese woodblock printing that is noted for its vibrancy and incredible detail.